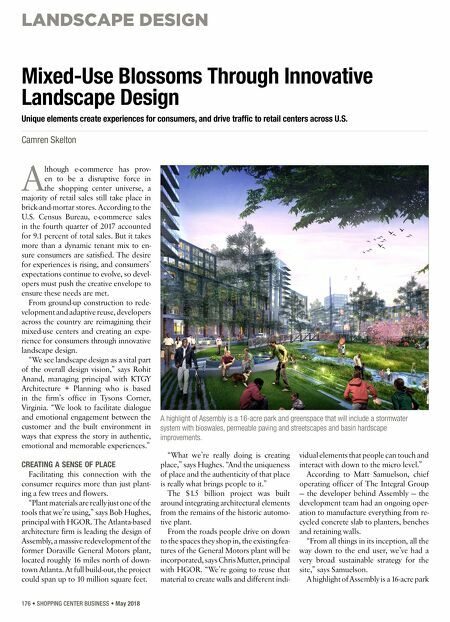 LANDSCAPE DESIGN 176 • SHOPPING CENTER BUSINESS • May 2018 A lthough e-commerce has prov- en to be a disruptive force in the shopping center universe, a majority of retail sales still take place in brick-and-mortar stores. According to the U.S. Census Bureau, e-commerce sales in the fourth quarter of 2017 accounted for 9.1 percent of total sales. But it takes more than a dynamic tenant mix to en- sure consumers are satisfied. The desire for experiences is rising, and consumers' expectations continue to evolve, so devel- opers must push the creative envelope to ensure these needs are met. From ground-up construction to rede- velopment and adaptive reuse, developers across the country are reimagining their mixed-use centers and creating an expe- rience for consumers through innovative landscape design. "We see landscape design as a vital part of the overall design vision," says Rohit Anand, managing principal with KTGY Architecture + Planning who is based in the firm's office in Tysons Corner, Virginia. 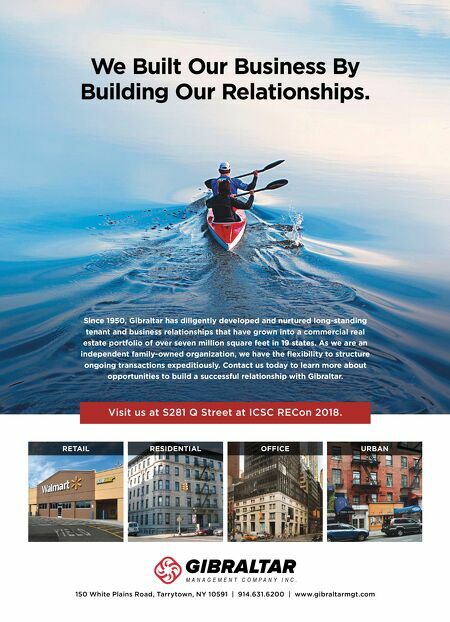 "We look to facilitate dialogue and emotional engagement between the customer and the built environment in ways that express the story in authentic, emotional and memorable experiences." CREATING A SENSE OF PLACE Facilitating this connection with the consumer requires more than just plant- ing a few trees and flowers. "Plant materials are really just one of the tools that we're using," says Bob Hughes, principal with HGOR. The Atlanta-based architecture firm is leading the design of Assembly, a massive redevelopment of the former Doraville General Motors plant, located roughly 16 miles north of down- town Atlanta. At full build-out, the project could span up to 10 million square feet. "What we're really doing is creating place," says Hughes. "And the uniqueness of place and the authenticity of that place is really what brings people to it." The $1.5 billion project was built around integrating architectural elements from the remains of the historic automo- tive plant. From the roads people drive on down to the spaces they shop in, the existing fea- tures of the General Motors plant will be incorporated, says Chris Mutter, principal with HGOR. "We're going to reuse that material to create walls and different indi- vidual elements that people can touch and interact with down to the micro level." According to Matt Samuelson, chief operating officer of The Integral Group — the developer behind Assembly — the development team had an ongoing oper- ation to manufacture everything from re- cycled concrete slab to planters, benches and retaining walls. "From all things in its inception, all the way down to the end user, we've had a very broad sustainable strategy for the site," says Samuelson. A highlight of Assembly is a 16-acre park Mixed-Use Blossoms Through Innovative Landscape Design Unique elements create experiences for consumers, and drive traffic to retail centers across U.S. Camren Skelton A highlight of Assembly is a 16-acre park and greenspace that will include a stormwater system with bioswales, permeable paving and streetscapes and basin hardscape improvements.